You are here: Home Forum Home MFG Owners Group What year is this MFG Edinboro Custom???? What year is this MFG Edinboro Custom???? 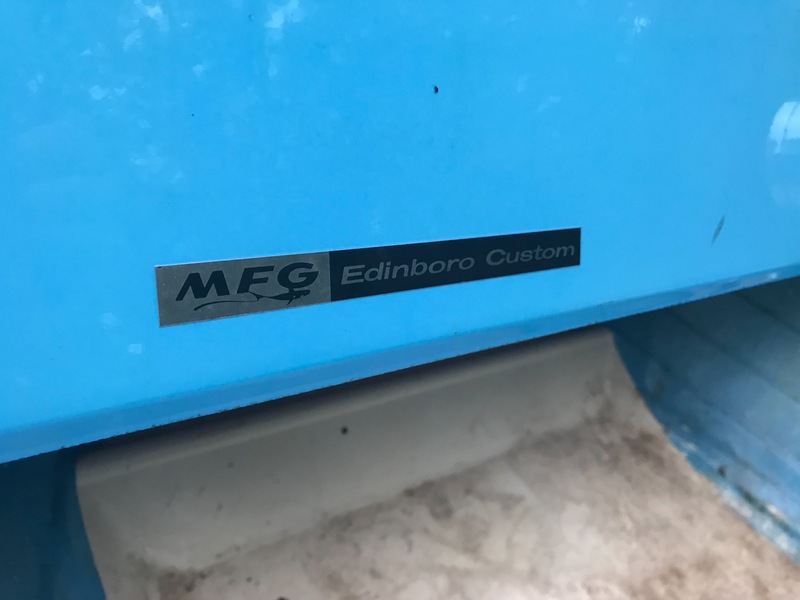 TOPIC:	What year is this MFG Edinboro Custom???? Hey fellas, I picked up this old MFG Edinboro custom by accident (boy was my wife thrilled). It was on a trailer I bought and the guy just said take it with me. Im thinking it will be a cool project for me and my boy. I did a little digging, but couldnt nail down the year more than 1964-1966. its all fiberglass (except the transom which i had to vaccum out). I dropped it in the pond, and by some miracle it still holds water. With the blue storage cubbies, and the aluminum ski racks with black trim, it is a 1964. 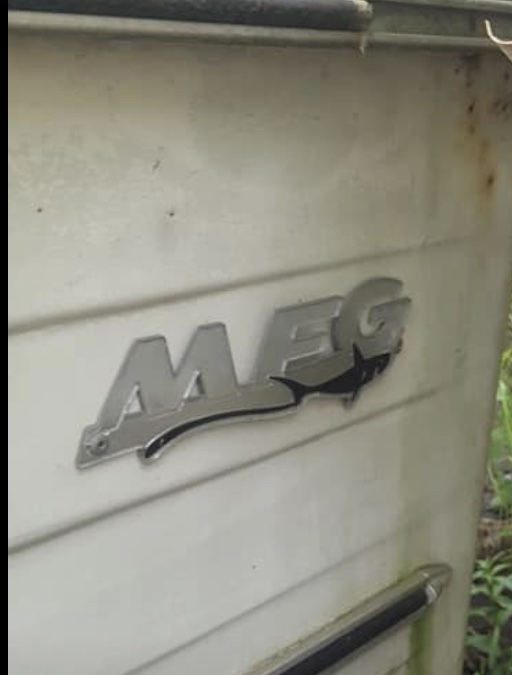 That year, some have a MFG sticker on the gunwhale near the stern, and some have the usual MFG side emblem with the black shark below. Yours has the latter. Is your emblem die cast metal or the later plastic version? I am curious as the only 64 I have seen close up had the sticker. I know for sure the 1961-1963 emblems were metal, and our 65 was plastic. I have a 1962 Edinboro - see picture. I am real familiar with MFGs of this era. My dad had four while I was growing up, including a 1965 Edinboro. 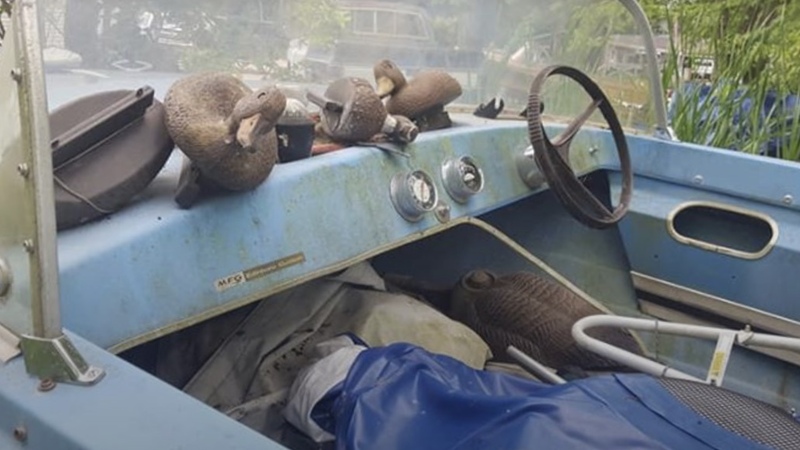 BTW, the shot shows a 1993 Chris-Craft Caper and a 1989 Boston Whaler Mischief. 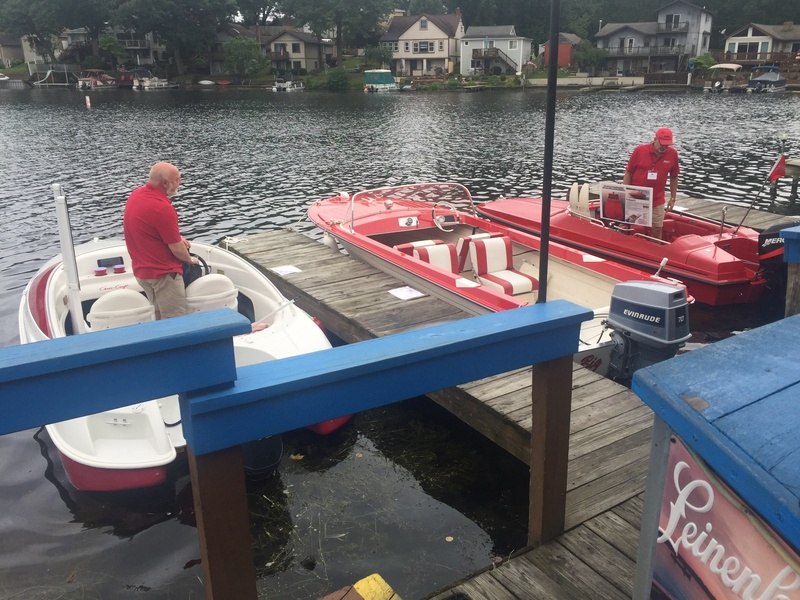 We like red on our local ACBS chapter! If you need suggestions on restoration, let me know. That is some great info, I knew somebody here would recognize it. The emblems are plastic. Structurally it seems in pretty darn good shape. My plan is to rebuild the transom and drop an older evinrude i had already on it. Were these built with floors inside the fiberglass? 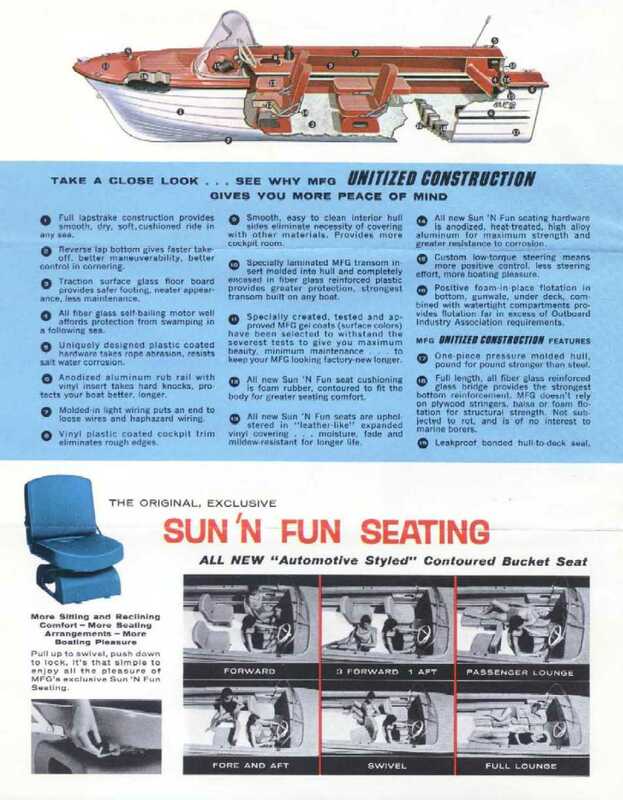 I dont care much for the idea of bolting seats into the fiberglass. Plastic emblems, OK. Now we know MFG switched to plastic in 1964. I suspect the stickers were for early in the 1964 model year, with the plastic emblems likely delayed from their supplier. The inside floors are fiberglass bonded to fiberglass stringers and the hull itself. Seats are attached using well nuts through holes in the floor. I would replace the well nuts with new ones, which for your boat I think that is 14 or so nuts. The black rubber inserts eventually deteriorate, and can let water get under the floor and saturate the foam between the stringers. It adds a lot of weight if that happens. Tilt the boat up, remove the right hand plug in the transom, and see if any water runs out. You can also check with a moisture meter. Mine has some moisture, but when I weighed it, it was close enough to expected weight for me to deem it negligible. Check carefully for any damage to the keel from the trailer rollers, along with any other damage to the hull. I actually had three holes and lots of cracks to fix. The deck gel coat is very thick. Mine came back with four sanding steps, four polishing steps, followed by a UV glaze, along with fixing a few damaged spots. It is almost impossible to match colored decks, but if repairs are small, they do not show much. I was adamant about using only gel coat for repairs, but it is more expensive than paint and takes more post-spray finishing. It is like spraying mud. For transom repair, I would do a poured transom using Carbon-Core CarbonBond or SeaCast. I used the former on my 62 and my brother used the latter on our old green deck 65. Both work, but I like CarbonBond better. Key thing is to absolutely clean out all the old wood. I had the inner skin cut away, leaving a tab, had fiberglass repaired, then re-attached. Trick is getting the curved transom correct. We found a rib from a big Lyman was the exact radius needed and used that as a form. Click on the How to Section on left side.